Tatiana and Chris Wojtan‘s favourite finds are two Robsjohn-Gibbings chairs, which hold pride of place in their living room. Designer Terence Harold Robsjohn-Gibbings (1905–1976) was a British-born architect and furniture designer who lived and worked primarily in the United States. After opening a showroom in New York City in the mid-1930s, he quickly became a much-sought-after decorator and contemporary furniture designer whose list of wealthy clients was a who’s who of American society at the time. 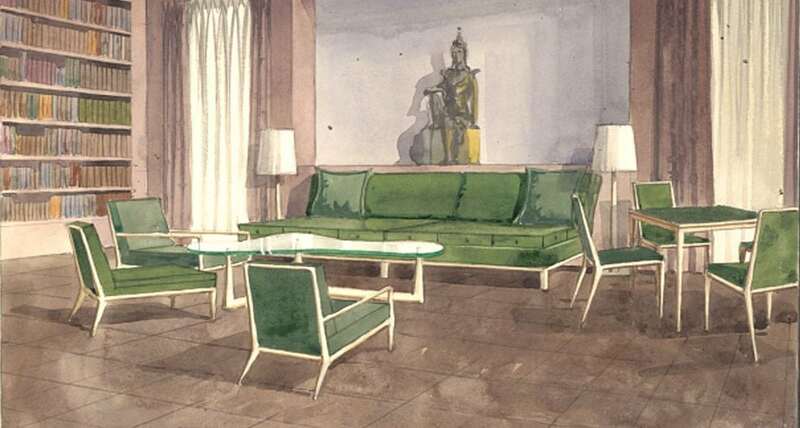 Robsjohn-Gibbings was celebrated for blending ancient Greek and art deco design elements to produce his own unique mid-century-modern style. His work has become quite collectible in the past few decades, with fans like Tatiana searching it out online and at auctions. She discovered the first of the not-quite-matching pair of mahogany chairs on eBay about five years ago. Made in 1956, it arrived in Ottawa with no cushions. It would take another three years of searching before she found the second chair on Etsy. It differs very slightly from the first in the angle of the seat. This one came with cushions, now upholstered in the palest sky-blue fabric.